On August 31, Alex and I paced Kate's room, walked the halls, celebrated the joy of new beginnings, worried about when Kate's life saving cells would arrive, and cherished every moment with our miracle. I can't explain the emotions of that day. We were so happy for Kate's second chance. So happy that Kate was hours away from being filled with healthy, strong cells. Cells that would save her. That would save our family. Because let's be honest - our daughter was dying. And I am not sure my family, my marriage, or myself would have survived losing her. While all of this was going on - while Alex and I were preparing for the biggest moment of our daughter's life - and our life - something else was going on somewhere in this country. Another mother was nervous, excited, proud. Nervous to watch her son be taken back and put under general anesthesia. Excited to know that her son, the son she gave life to 24 years ago, would be saving the life of a precious baby. Proud that she raised such a wonderful young man. I was pacing, she was knitting, and we were both praying - praying not only for our own child, but a stranger's child as well. I now know what she was doing because today, I received a letter from this amazing woman and Kate received the blanket her donor's mother started crafting while her son was in surgery giving life. We knew we had a package waiting from Kate's donor but never in a million years did I expect something so personal, so heartfelt, or so perfect. To read the words "we count it a privilege to continue to pray. Her artwork is precious to our son and family." took my breath away. When Kate opened her box, she gasped (her knew thing - she does it when she is excited) and gave the blanket a huge hug. It's as if she knew it had special meaning. She held it with pride and cuddled it as if it was a lovely she'd been attached to since birth. It is evident that Kate's selfless donor learned his ways from his mother (and I'd imagine his father too). There is no doubt. This is a gift to be cherished. Evidence that miracles happen. That good people are still out there. That we are on this journey with Kate's donor and his family. I can't wait to see the journey this blanket takes. Will it be taken to college? Will it keep Kate's first child warm as she bring him/her home from the hospital? Will it be passed down to my grandchildren and great grandchildren? One thing is for sure, any journey Kate and this blanket take is only possible because of the miracle our Lord worked 24 years ago when he created Kate's perfect match. What a beautiful gift - in sight and thought. Beautiful. Just beautiful. The blanket, the thoughtfulness, God's hand in it all. Beautiful. beautifully written. Such a thoughtful gift from a woman who obviously raised a wonderful boy/ I hope that you get to talk to them/meet them someday! Very sweet! What a beautiful gift! Beautifully written and a beautiful gift. What an amazing family. Both families. I have tears in my eyes reading this, what an amazing man and his mother, I'm sure that his whole family is amazing. I can't wait for the day when you guys can meet him. Tears are flowing reading this! I sit here with tears at how wonderfully that was written. What a wonderful, priceless gift. Wow, I just got chills. Two precious gifts from this sweet family. Such love. Beautifully written. What an awesome God we have!! Such a precious gift!! This gave me goosebumps! What an AMAZING family that young man must come from!! Such a priceless gift!! I am getting choked up as well. That is a beautiful gift (or beautiful gifts, rather!) - from both people in the same family! This is beautiful. What a wonderful gift, and a wonderful family. I can tell you, you will always cherish that blanket. The hospital that my son passed away in had volunteers crochet blankets and then donate them to the sick kids. My son was wrapped in one when he passed. I sleep with it every single night. It's been on vacation with us. It's like my blankie, my comfort. It brings me so much joy, as I know Kate's blanket will you and her. beautiful story. beautiful blog. this young man has no idea how he has touched our family. love you! That is so beautiful. What an amazing gift. I want you to know that I signed up to be a donor because of little Miss Kate and received my test packet in the mail today. Such a beautiful gift! Brought tears to my eyes. They sound like truly amazing people. Kate is so loved! That's absolutely precious. :) What a special moment/thing to have. So incredibly special. And what a wonderful family you have, as well as your donor has. I can only pray to raise my child with the same dignity and caring heart as they have. What an amazing gift! It's so refreshing to read about the great in people. Kate is a very lucky girl to have so much love around her. So incredible!! The tears are rolling down my cheek as I type! Something I'm sure you all will cherish forever! 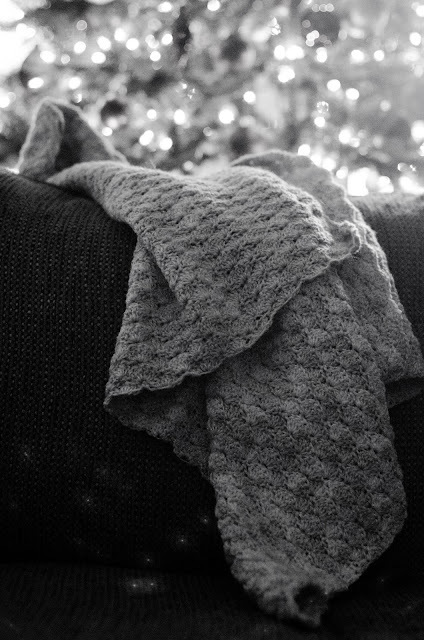 My Christmas wish for you is that that blanket lives to be tattered, torn, thread-bare and loved. Oh this made me cry! Just beautiful! I came across your blog just recently and went back to the beginning so I could fully understand your journey (something I do with every blog I read). I've enjoyed reading all of the posts but this is my favorite so far and the first one to drive me to comment, over a year and a half later. Your and your family's strength astound me.